We stayed many times in the RV area over by the gas station. It was convenient and with your paid site fee of $15 you were given a few coupons. Over the last couple of years the coupons reduced in value but it was still a good place to stay. 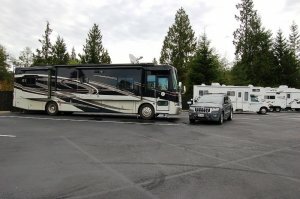 We were very surprised when they eliminated the RV area which had electric hook ups for each site. The whole area was paved over. I was talking to an employee and asked what the deal was. He said the Casino is leased and on Tribal land so they have no say about changes. The parking lot, which now includes the old RV area, is ridiculously enormous. They could never accommodate the crowd if every parking space was used. It's funny that some casino's perception is that rv'ers don't spend money. Most of us gamble AND eat and drink in their restaurants. We really liked Angel of the Winds but until (and if) they put in more RV parking we'll stay free at Tulalip or pay $30 at Swinomish on Fidalgo Bay where they welcome you.